Recommended as the best fabric protector by leading outdoor fabric manufacturer Sunbrella®. Restores lasting water repellency; treated fabrics repel water which guards against mildew formation. Stops leaks, protects against soiling and both water & oil based stains. Does not alter fabric color, feel or breathability. Spray on, let dry. 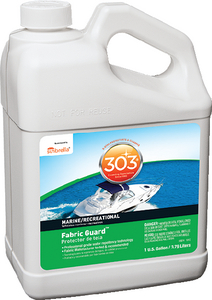 For best results start by cleaning the fabric with 303® Fabric/Vinyl Cleaner™. 30601 is sold in case pack only.